To make the filling, heat two tablespoons of oil in a wok; add the onion, carrots and capsicum and stir-fry for half a minute. Add the cabbage and continue to stir-fry for one minute. Add the soy sauce, white pepper powder, Sichuan sauce, MSG and salt to taste. Add the bean sprouts and spring onion greens and stir-fry for about half a minute. Remove from heat and cool the filling to room temperature. Heat and season a dosa tawa. Place a ladleful of dosa batter on the tawa and spread evenly with the back of the ladle to make a medium-sized dosa. 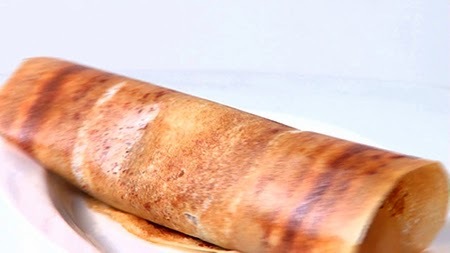 Drizzle half a teaspoon of oil around the dosa and cook over low heat for one minute. Place a generous amount of filling on the dosa and spread evenly. Continue to cook till the underside turns golden. Roll up the dosa tightly, cut diagonally into pieces and serve.